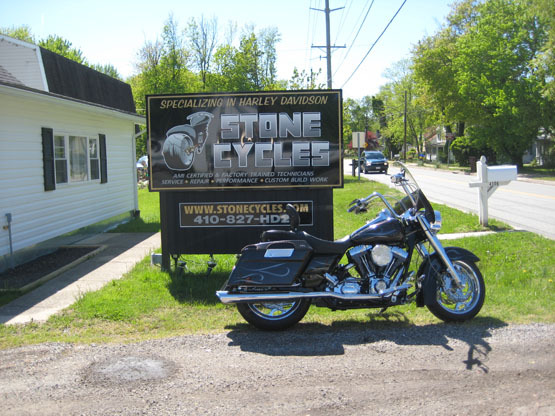 Stone Cycles was formed in 1995 and moved to Kent Island, MD. We have been in the area for 17 years with over 27 years experience in the Harley Davidson industry. We carry all major brands even Genuine Harley Davidson. We strive to offer only quality + reliability in our craftsmanship. Our technicians are HD factory trained and American Motorcycle Institute certified. We do "EFI" programing and performance carburetor tuning. We perform regularly scheduled services, repairs, performance work and have parts + accessories for your bike. We also offer wide tire and trike conversions; tire mounting and computer spin balancing, extended bags and fender change-outs, led lighting or ground-up builds and can offer you custom paint by Barry Gibson of ProArtWorks. © 2019 Stone Cycles. All rights reserved.